Finally there is a trigger worthy of your favorite automatic shotgun! This trigger comes as close as it can to that found in a fine European style over and under shotgun and should certainly re-kindle positive thoughts of using an automatic. Crisp, light and you will marvel at how quickly it resets with minimal travel. 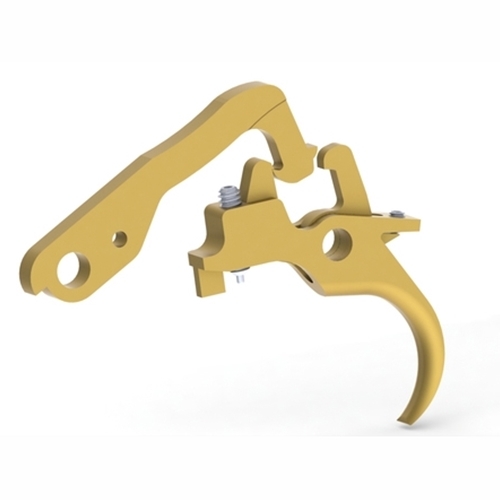 With the use of computer assisted design we have been able to accurately dial in the engagements resulting in desired trigger pulls. Converting your trigger to match potential is easy! We will complete your conversion and your return trigger within two weeks. Trigger sets will be available in both long and short length of pull (Length of Pull is the distance from the center of the trigger to the center of the rear of the pad). Short LOP is factory (except for 303) and Long LOP moves the trigger forward .25"
Adjustable in that they are set to have minimal pre and after fire travel. This allows for a minimum time from fire to reset thus allowing quicker split times shot to shot resulting in minimal trigger freeze. Engagements have also been improved to allow for better, smoother, and crisper releases. TITANIUM NITRIDE finish to improve lubricity. Trigger shoes are not currently available. Please note, this requires you to send us your trigger group for conversion. This is not a drop in replacement trigger group. Please note, the A303 will only take the long length of pull trigger. 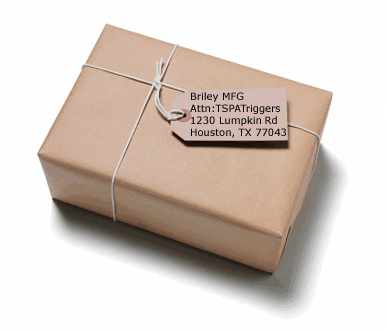 International Customers, please note: before sending your trigger assembly, please contact us first. Export permits are required for certain countries and may incur additional cost.